SEBI introduced Direct Plans of mutual funds have turned out to be a major boon for investors in 2016 - 2017 by giving higher returns as compared to regular plans. On an average direct plans have given at least 1% additional returns for investors in equity mutual funds. 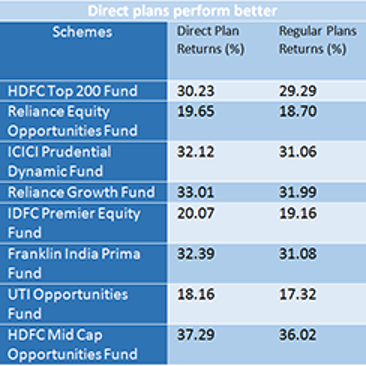 Leading schemes like HDFC Top 200-Direct Plan gave 30.23% returns while the regular plan of the same scheme delivered 29.29%, ICICI Prudential Dynamic Fund's direct plan gave 32% return as against 31% by regular plan. Likewise, Reliance Equity Opportunities Fund-Direct Plan offered 19.65% versus 18.70 % given under regular plan. What seems like a small percentage could snowball into a large corpus as this difference will persist and keep compounding every year. For example, if investors invested 10,000 rupees monthly for 15 years with an average CAGR of 15%, they would earn ? Rs. 78.76 lakhs in direct plans whereas the regular plan would earn them only ? Rs. 67.69 lakhs. A direct increase of ? Rs. 11,07,688 in earnings due to direct plans, assuming a difference of 0.8% in expense ratios of direct and regular plans. 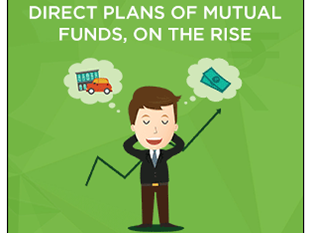 Despite, it's obvious benefits only 12% of individual investors have shifted to direct plans of mutual funds. Only 7% of equity funds assets were attributed to direct plans by 31st December 2016, a relative increase of 3% from 4.16% in 2013-2014. The reason for this reluctance to shift from regular to direct plans is the perception that transferring to the direct plans is tedious and time consuming. MoneyFront, an online robo-advisory portal that strives to make investment in direct plans extremely accessible to retail investors has simplified the switch process from regular to direct via an automated 3-step procedure. All investors need to do, is to upload their existing portfolio on the MoneyFront portal in a pre-defined format, select which schemes they want to shift and press execute. MoneyFront will also analyse the portfolio and guide investors with long-term and short-term holdings in Debt and Equity funds, and the choice to switch or not will be the investors prerogative. This process is 100% paperless and completely online, giving the investors the comfort of switching their portfolio anytime and anywhere they choose. 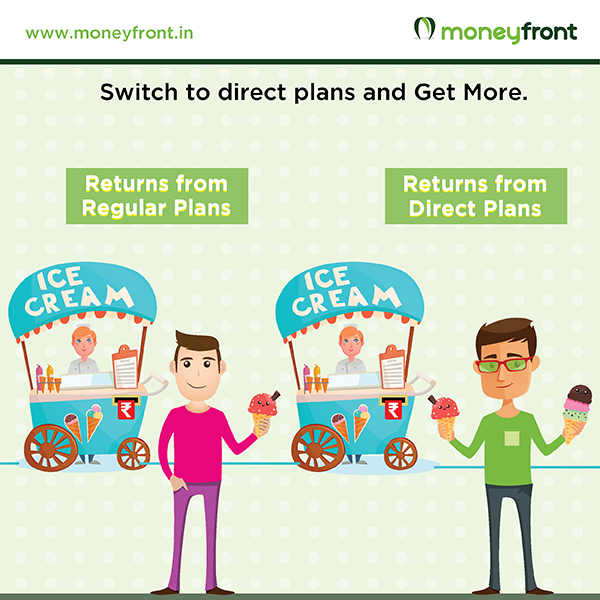 MoneyFront also caters to the needs of new investors who lack awareness about direct plans. MoneyFront offers an automated investment advisory that provides model portfolios tailor-made to the investor's financial goals and risk tolerance levels. Over and above that, investors have access to a vast library of news, views, developments and statistics related to mutual fund schemes and everything else that impacts them. Moneyfront also provides intelligent calculators to empower the investor with expected savings, past performance of schemes, wealth calculators and retirement planning. With this encyclopaedic level knowledge at their disposal, investors can make a well-informed decision on the right schemes to invest. Mr. Mohit Gang, Co -Founder and CEO, MoneyFront.in, quotes, "Direct plans of mutual funds were introduced for the benefit of retail investors for whom every paisa is important. However, retail investors have shied away from switching to direct plans or investing in them due to lack of knowledge on the grassroot level. MoneyFront through our simplified switch tool and user-friendly investment process ensures that retail investors conveniently and comfortably can get maximum returns from their investments. Furthermore, our robo-advisory ensures that new investors, invest in the best possible schemes which are suitable to their risk and return preferences. All we aim for is that retail investors are empowered to become masters of their money through MoneyFront." 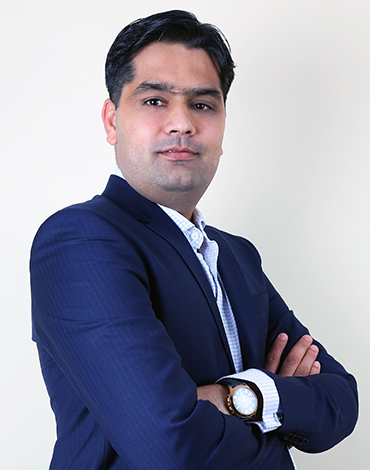 Over and above being a 100% paperless, completely online platform with a simplified investment and switch process, MoneyFront also offers unique features like investment options for NRI's and minors, managing portfolios of all family members under one login, opening joint accounts and an income estimator that enables investors to get a live update on what they can anticipate from their investments through the financial year. Moneyfront will also be launching its android mobile application in the last week of April, which will put the process of tracking the portfolios and transacting on the fingertips of investors. MoneyFront is the brainchild of three childhood friends all hailing from different companies, yet conjoined with their passion for Investments -Mohit Gang (ex-SVP, HSBC Bank), Anil Bang (Analyst, Marshall Wace) and Puneet Mehta (ex-Director, BOA-Merrill). All experts in their domains, they setup MoneyFront with a single-minded objective to enable investors to get more returns from their investments. 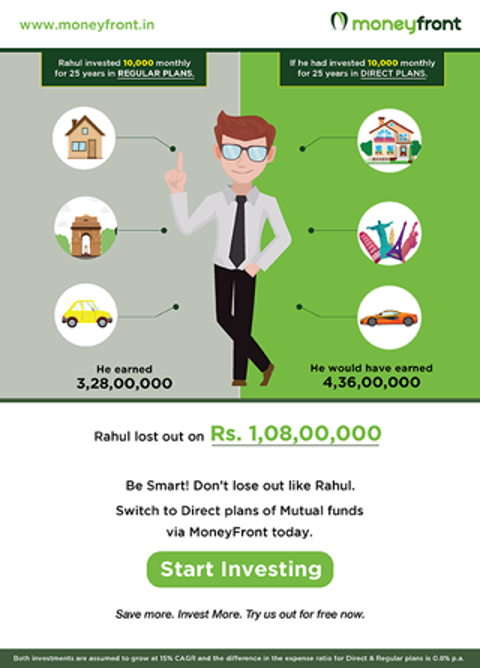 Within merely few months of inception, MoneyFront.in has become synonymous with direct plans of mutual funds, has achieved critical acclaim and over 3,500 signups. Andheri East Mumbai - 400 099.